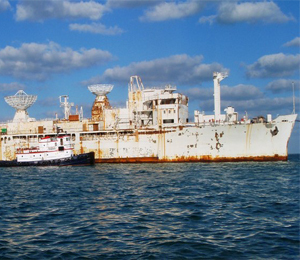 On May 27, 2009, the USNS Gen. Hoyt S. Vandenberg was scuttled to serve as an artificial reef located off the Florida Keys. She is the southernmost ship on the Florida Keys Shipwreck Trail, submerged about 7 miles offshore between Western Sambo and Sand Key. Artificial reefs facilitate the creation of marine habitats and thereby increase marine life. Before sinking a ship, crews must remove contaminants hazardous to the marine environment including asbestos, carcinogens, refuse, mercury compounds, and paint chips. Also, before sinking the ship, several Key West diving expeditions confirmed the ship would be placed on a barren bottom with no coral or other historic wrecks. The Vandenberg was utilized by the United States Navy, Army, and Air Force at various times throughout her career. She served as a missile range instrumentation ship during the Cold War, and was featured as a Russian science vessel in the motion picture andldquo;Virusandrdquo; in 1999. For this reason, divers can expect to see Russian Cyrillic lettering at various dive points on the ship. The Vandenberg is approximately 100 feet tall, and deployed at 140 feet. Thus, her highest points are submerged a mere 40 feet below the surface. She is 524 feet long, making it impossible to see the ship in its entirety from bow to stern. Since her sinking in 2009, the Vandenberg has become habitat to algae, corals, invertebrates, grouper, dorado, sailfish, bait, and barracuda. As the habitat flourishes, Key West diving aficionados can anticipate sponges, sea fans, and sea whips. 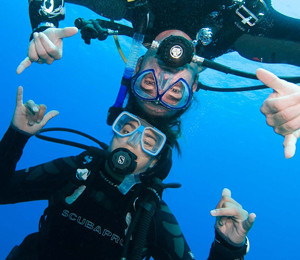 Though divers descend along dozens of lead lines, the superstructure is open and easy to maneuver, making it a great location for both beginner and experienced divers. Divers experienced in light-wreck penetration can explore the cargo holds, hallways, and stair towers. 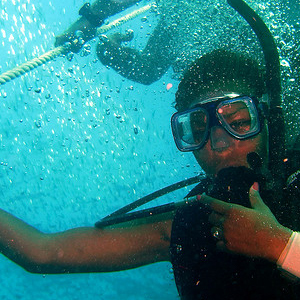 Advanced and skilled divers are provided swim-through opportunities via the scuttle holes. Divers who submerge at the bow of the ship can see the king post and foremast. Neutral divers can drift aft for 55 to 70 feet and see the bridge, wheelhouse, and telescope. Behind the bridge, divers can view the ship’s two radar dishes. The larger dish was featured in the movie andldquo;Virusandrdquo; where it was demolished. In reality, the dish was not destroyed, but it did detach from the ship during scuttle. The dish has since been reattached and is a breeding shelter for various kinds of fish. Divers who submerge at the aft of the ship can view the foremast with crow’s nest, and the bottom of the smokestack. The weather balloon hanger at the stern has been designated as an underwater clubhouse and dubbed andldquo;underwater Margaritavilleandrdquo; as a tribute to several Jimmy Buffett fan clubs who contributed significantly to the project. Inside the hanger, steel plaques commemorate the various clubs who donated. For those interested in Key West diving, the Vandenberg is a must see! 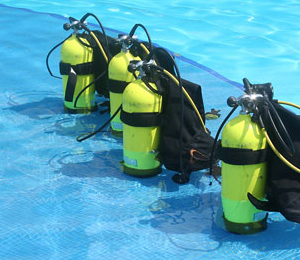 Due to the ever-changing ecosystem, the immense size of the ship, and various skill level requirements, divers can expect a unique experience every time they visit the Vandenberg.